Today is the 20th anniversary of the enactment of the Brady law. Here are some facts from then and now according to this piece in the Washington Post. Some changes have occurred since the law was enacted in Feb. of 2014. For example, fewer people die from gun homicides now than then. Support for the NRA has stayed about the same in spite of the resistance of their lobbyists and leaders to any kind of common sense measures to save more lives. Guns are still found in a lot of American homes. People are not satisfied with our country's gun laws which could mean they want them to be stronger or they want them to be weaker. Background checks work to stop people who shouldn't have guns when purchased through licensed dealers. We have new markets now for guns than 20 years ago providing for more unregulated sales of guns. Congress is still under the thumb of the corporate gun lobby. States have passed measures to weaken gun laws. Passing laws requiring background checks on all gun sales — or at the least, on sales at gun shows and Internet sites — is simple. Private sales amongst family members and friends would be exempt from background checks. There would be no registration or confiscation. This satisfies the fears of gun-rights advocates, and yet they strongly resist common-sense measures to assure guns don’t go to people who shouldn’t have them. It’s time for a change to our laws. Ask Congress and state legislators to finish the job started 20 years ago and expand background checks to the private sales of guns. In the name of preventing the gun violence that devastates families all over America, we need to do a better job of public safety. Here at the Gun Report we often come across careless handling of firearms, which can be deadly, especially when children find and discharge them. But it looks like the A.T.F. is having the same problem. A report by the Milwaukee Journal Sentinel yesterday catalogued several instances of agents stashing guns under the front seats of their cars, in glove compartments or leaving them on top of their vehicles and driving away. Agents also left their guns in bathroom stalls, at a hospital, outside a movie theater and on a plane. Often the agents don’t report the incidents. A Texas police officer and his wife have been found shot to death in their Dallas area home in what investigators are calling a murder-suicide. In a clip posted online just five days before the tragic murder-suicide, Sgt Pitofsky gave a rave review to a Mossberg 500 shotgun. 'I purchased this as a self-defense weapon for my household, essentially for my wife,' he chillingly says in the video. So let's review. This Texas police officer was well thought of and dedicated to his job. But he was also very jealous about his wife being on Facebook so he bought a gun specifically for "a self defense weapon for my household, essentially for my wife..." What he forgot to say is that he was so jealous of something about his wife that he went to buy a gun to kill his wife. "Self defense" weapons often get used to kill someone you know or love. Guns are dangerous. When a gun is around during a domestic dispute, circumstances can turn tragic in an instant. That is the gun culture we have in American. We have a lot of guns- a lot of gun owners. A lot of gun owners own a lot of guns. We have a lot of shootings. Many of them are domestic in nature and not in self defense. We have a lot of kids shooting themselves and others with guns left around by their law abiding owners. We have a lot of gun suicides committed with guns stored irresponsibly or just because a gun is available. We have a lot of "accidental discharges" or irresponsible gun incidents committed by law abiding gun owners and even by law enforcement officers. We sell a lot of guns with no background checks when we could easily pass a law to stop some dangerous folks from getting guns. Not all law abiding gun purchasers are careful or responsible with their guns. Sometimes law abiding people shoot someone in a split second. A gun makes that very easy to do. And then suddenly, that law abiding person is not law abiding any more. The take away from all of this is that we can certainly do better than this as a country. No law will stop all injuries and deaths. No law stops all car accidents, or drownings or other accidental deaths. No law stops all felons from committing crimes. But that doesn't mean we shouldn't have laws for the common good in the interest of public safety. If we care about a civil society and whether or not we are doing all we can do to try to prevent deaths and injuries of our friends and family members, we will demand that our elected leaders change their collective minds and do the right thing. The national conversation has begun and it will continue. This is hard work. We're willing to work hard for change. We remember too many lives lost. We remember, like Sarah Brady remembers, that even when a loved one is severely wounded and left disabled for the rest of his life, as her husband Jim Brady was, the wheels of government work slowly when a noisy well funded group doesn't want something to happen. 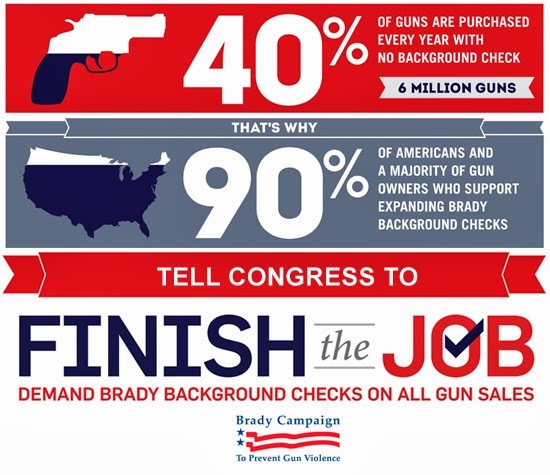 Finishing the Job to expand background checks would save lives. That is the bottom line. As long as we remember that, the fight for common sense is worth fighting. The American public wants the background check system to be improved and strengthened. The American people don't like the high profile mass shootings that shed a light on our weak gun laws and make victims out of first graders, out of women in domestic shootings, out of innocent college students, out of theater goers, out of young men of color, out of children shot accidentally, out of mall shoppers. But the public is often unaware of the daily body count due to gun violence. The public is unaware that 40% of gun sales go without background checks. The families affected by shootings are aware and are telling their stories. Here is a story told by a concerned father who hunts and owns guns but understands the importance of laws to keep us safe from gun violence. The pro-gun contingent likes to talk about responsibility. They talk about it in spite of the statistics. They talk about it in spite of the fact that gun owners whose weapons are used to accidentally kill children are rarely prosecuted, particularly if they're white. They talk about responsibility with a weird reverence, like Reagan-era Republicans talk about America in the 1950s. Their disappointment that we're not living in Mayberry is palpable, and they won't accept any other solution. Trouble is, I grew up in a Mayberry of my own, and I see the fault lines. My father, in some ways, represents both the NRA's ideal of responsible gun ownership and the best arguments against the NRA itself. A lifelong (and prolific) gun owner and sportsman, my dad brought me up with an iron-fisted, zero-tolerance attitude toward improper gun handling. His attitude was informed by a lifetime of watching bullets and shotgun pellets rip into flesh, and by some relatives dead before firearms. I was not allowed to even point toy guns are other people. Imagine being raised in the South in the 1970s with that rule. But guns were everywhere in my father's life, including in my hands quite a lot. I was taught how to use them safely... or as safely as a child can. But they were there, in the television shows (Lone Ranger, Cisco Kid, John Wayne) we watched together on television, and in the drawer by my dad's chair. And for quite a long time, under the seat of my father's car, which is the unlikely starting point for dad's split with the NRA. After an incident, the details of which are unimportant, my father decided to stop taking a gun with him everywhere he went. He had a moment — an exceedingly rare moment, among American gun owners — of recognition of his own limitations in which he decided that he couldn't necessarily trust his own judgment in all circumstances, and that it would be better to not always have a gun on hand as a potential solution. 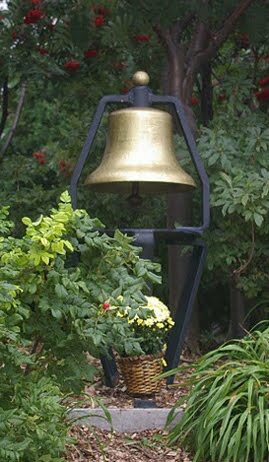 We have all made our share of mistakes; adding deadly weapons to that reality seems foolish. Years later, Dad canceled his lifetime membership in the NRA over the organization's pro-assault weapon stance. He had grown up with a more moderate NRA that advocated for reasonable gun policies, and found it incomprehensible that the organization could support the private ownership of what he calls "people-killing guns"... that is, weapons with no legitimate purpose other than the destruction of human beings. Here are more facts. In contrast to checking people to make sure they are law abiding, not dangerously mentally ill or a domestic abuser, states are passing laws to weaken this system.